The Southwest Texas Junior College Testing Center strives to provide students with an accessible, affordable, and convenient place to take their exams. Beginning in Fall 2013, the State of Texas will allow only one assessment test to be used to determine a student's Texas Success Initiative status. The New TSI Assessment will replace the Accuplacer Exam. Students whose TSI status was determined on the previous test must enroll in college by August 22, 2013, or must plan to test again under the new assessment. All students must have completed an Application Form for SWTJC. All students must have received an SWTJC Student ID number from the Admissions Office. All students taking the TSI Assessment must have completed the Pre-Assessment Activity that is required of all students by the State of Texas prior to TSI testing. All students must present a valid Photo ID: High School ID, Driver’s License, DPS ID, Passport, or Government Issued ID. Be prepared to spend 4 to 8 hours testing. Students are not allowed a lunch break. However, they are allowed a 15-minute break between sessions. All Students must arrive 30 minutes before the scheduled test. No personal belongings will be allowed in the testing area. All personal belongings must be left at home, such as cell phones, bags, purses, jackets, caps, watches, keys, sunglasses, etc. We are not responsible for lost, stolen, or damaged items. All students must present their printed Pre-Assessment Certificate with their SWTJC Student ID number on it. SWTJC ID number is required for TSI testing. SWTJC serves as a proctoring site for distance learning students from across the country and will proctor exams for US accredited college and universities, including courses via Internet, and VCT courses. We offer a secure testing environment for a variety of exams including paper/pencil and computer-based exams. 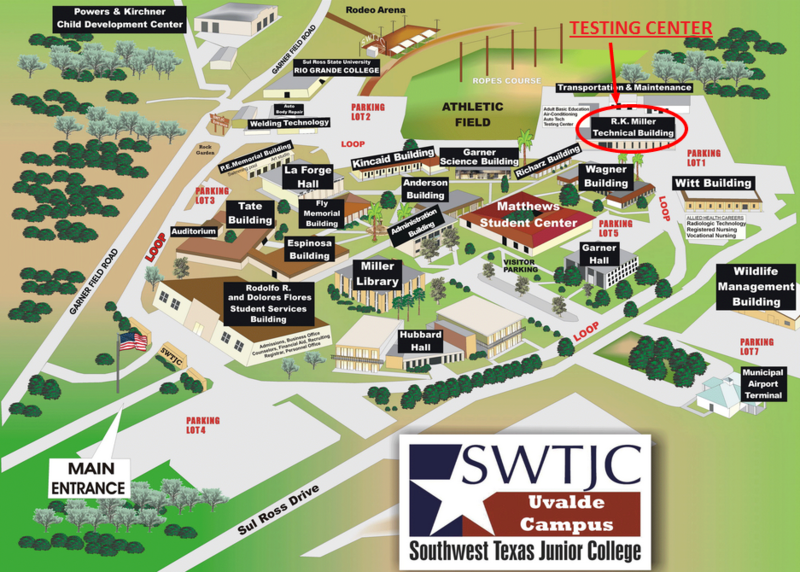 The student must first contact the SWTJC Testing Center office and get the center’s information. The student must then contact their institution and provide them the information on where to send the testing materials. SWTJC must have the exam materials before a test date will be scheduled. Please allow 3 – 5 business days before calling to make an appointment to ensure that we have time to process your test materials. We do not accept Walk-Ins. Correspondence exams are proctored Monday through Thursday 8:30 AM to 2:30 PM. The administration fee for correspondence exams is $20.00 per sitting, payable online when registering to take the exam. Please contact the Testing Center for instructions on how to register at (830) 591-2946. To cancel or reschedule, contact the Testing Center at least 24 hours in advance. A valid picture ID is required to take the exam. The College-Level Examination Program® (CLEP) gives you the opportunity to receive college credit for what you already know by earning qualifying scores on any of 33 examinations. Each college sets its CLEP policy regarding how much credit will be granted and for what courses. Contact your college's admission's office or a career academic adviser for more information. Find Out Your College's CLEP Policy. Each college sets its own policy regarding which CLEP exams it will grant credit for and how many credits it will award. Contact your admission officer or academic adviser to learn more about the CLEP policy at your institution. If you are not yet enrolled in a college when you take your CLEP exam, you can send your scores to your college when you enroll. For a list of the colleges that grant credit for CLEP, visit the Institution Search. Log In to the My Account Registration Portal. You can create and manage your personal account through the My Account registration portal. The registration platform will allow you to register for a CLEP exam 24/7, manage your personal information any time prior to taking the exam, search for test centers, select your score recipient institution, and purchase study materials. Be sure your account information matches the information on your photo I.D. EXACTLY as it appears. Once you have purchased your CLEP exam ticket, schedule your testing date and time and pay the required testing fee. A PHOTO ID is REQUIRED EVERY TIME a test is taken. Examinees without proper ID will NOT BE ALLOWED to test. Examinees must arrive 15 minutes early on the day of the exam. All CLEP exams may be taken at SWTJC, but only the CLEP subject exams listed below may be accepted for credit at SWTJC according to policy. RETAKES: The College Board has a policy of having to wait three months from the date of the exam in order to retake a CLEP exam. SWTJC strictly adheres to this policy. For additional information about other CLEP exams, visit the College Board. SWTJC Testing Center now offers the Certified Phlebotomy Technician (CPT) & Certified Clinical Medical Assistant (CCMA) exams. Once you have purchased the exam, you must register with the Testing Center for a testing date and time. All exam registrations are final. Refunds are not offered for examination fees unless the scheduled examination date is canceled by NHA. After 6 months, the exam is no longer valid and the cost associated to the exam is forfeited. Once the exam is forfeited, the candidate must reapply as well as repurchase the exam. Arrive 30 minutes prior to scheduled appointment time. This allows time for sign-in and identification verification. Provide one (1) form of valid government-issued ID (non-expired) – driver’s license, state ID, or passport, which bears your photo, printed name, signature, date of birth, and expiration date. Acceptable forms of ID include Driver's License, State or Providence ID, Passport, Military ID, Tribal ID, Naturalization Card or Certificate of Citizenship, Permanent Resident Card, or Valid High School ID. Identified provided must match all information provided to PSI upon eligibility. An expired driver’s license will be accepted if accompanied by a VALID Texas Department of Public Safety temporary permit. SWTJC Testing Center offers the Texas Commission on Law Enforcement Officer Standards and Education (TCLEOSE) Exam for current SWTJC Police Academy Cadets and qualifying Jailers programs. Jailers’ exam is ONLY offered on Fridays by appointment only and must be scheduled two weeks in advance by contacting the testing center’s office. Jailers must have an endorsement approved before scheduling an exam date. Group testing is also offered on Fridays by appointment only and must be scheduled two weeks in advance by contacting the Testing Center’s office for details. Examinees must arrive 30 minutes before the scheduled test. Examinees must provide a Valid/Current Photo ID. No personal belongings will be allowed in the testing area. Payment must be made online during registration. Microsoft Office Specialist (MOS) continues as a globally recognized, standards-based certification program—the premier credential chosen by individuals seeking to validate their knowledge, skills, and abilities relating to the Microsoft Office application suite. The credential enables individuals who attain it to tap the full features and functionality of the Microsoft Office system, resulting in heightened levels of individual performance, confidence, and differentiation. The newest Microsoft Office Specialist credential validates skills in the Microsoft Office system, covering Microsoft® Office Word, Excel®, PowerPoint®, Access® and Outlook®. All candidates that take any of the certifications need to have an account, to create one, register here. For more information about the Microsoft® Office Specialists visit their official web page. Fee to be contingent on if registering with a class or as a public announcement. Any calculator students bring that does not match the accepted models cannot be brought into the testing room and used on Part 2 of the exam. Thank you for allowing us the opportunity to provide TSI testing to your high school students! Please review the steps below to help minimize potential issues on your school's test date. Contact Patricia P. Perez (office: (830) 591-7312 or email: ppperez@swtjc.edu) the Outreach Admissions Coordinator in order to obtain SWTJC ID numbers. All students must have a Valid Photo ID for test day. Schedule a TSI test date three (3) weeks in advance by calling the SWTJC Testing Center and make payment arrangements if the high school is sponsoring the students. Provide the Testing Center a list of all students testing no later than five (5) business days before test day. Please contact the Testing Center for the form template. If the above steps have not been completed five (5) business days before your TSI test date, please call the Testing Center to cancel and reschedule. Be prepared to spend 4 to 8 hours testing. Students are not allowed a lunch break. However, they are allowed a 10-15-minute break between sessions. High schools may provide some snacks or drinks, but they must be kept on the bus. No personal belongings will be allowed in the testing area. All personal belongings, such as cell phones, bags, purses, jackets, caps, watches, keys, sunglasses, etc. must be left at home, at school, or on the bus. We are not responsible for lost, stolen, or damaged items. All students must present a Valid Photo ID: High School ID, Driver’s License, DPS ID, Passport, Government Issued ID, or SWTJC Student ID Letter. If the requirements above are not provided on test day, students will not be allowed to test. Failure to register before the deadline will result in the student not being able to take their exam. Once the student receives a confirmation e-mail, the registration process is complete. I acknowledge that if I do not present a valid and acceptable photo ID on exam day I will not be allowed to take the exam. The Testing Center can proctor make-up exams on those occasions when students cannot attend their scheduled in-class test due to illness, an emergency, or some other unforeseen circumstance. Students can NOT schedule or reschedule make-up exams. They will need to have their instructors call the Testing Center to make the appointments. Students requiring make-up exams must make prior arrangements with their instructor before taking a make-up test in the Testing Center. Instructors may offer the option of a make-up exam to SWTJC students who have missed a classroom test. The Testing Center offers proctored make-up exams only when an instructor requests the service. We do not accept walk-ins. Make-up exams are proctored Monday through Thursday between 8:30 am to 3:00 pm. Late Policy: Students who are late (i.e., 15 min to the appointment time) forfeit their appointment spots. Students will be sent back to their instructors to reschedule an appointment. Cancellations and Rescheduling: Students can cancel a make-up exam by calling the Testing Center office but can NOT re-schedule one. If a student cancels the exam, they will need to coordinate with their instructor to schedule a new appointment. There is no proctoring fee charged to current SWTJC students. SWTJC requires verification of a disability in order to provide a nonstandard test administration. Candidates requesting testing accommodations are advised to contact Krystal Ballesteros to discuss their needs one month in advance of their proposed test date. GED & CLEP requires additional acceptable documentation (signed statement from an appropriate professional - a person licensed or certified to diagnosis the student’s disability) that describes the disability and verifies the need for testing accommodations). All documents must be current and must be presented on official letterhead from a licensed or certified professional appropriate for evaluating the candidate’s disability. 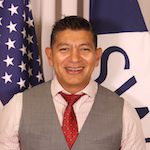 GED & CLEP reserves the right to request further verification of the professional’s credentials and expertise in relation to the recommendation and the right to retain an independent expert to evaluate the candidate’s documentation of disability. Special Testing Accommodations require extra preparation time and require a delay in scheduling the actual test administration. 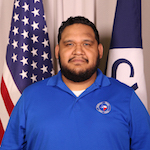 All students, regardless of disability, are responsible for adhering to the Student Code of Conduct published in the Southwest Texas Junior College Student Handbook. This includes cheating. Students who participated in special education programs while in elementary, middle, or high school were able to receive modifications in the school's behavior code. This option is not available at the college level. When registering for classes at SWTJC, the student must consider whether he/she will be able to adhere to the Student Code of Conduct. The Americans with Disabilities Act (ADA) does not excuse or protect an individual from penalty for misconduct or behavior blamed on an impairment. (Hamilton v. Southwestern Bell Telephone, 136 F.13d 1047, 1052 (5th Cir. 1998)). The center delivers quality testing services conducive for student success to current students, prospective students, and the community. The Center is also bound by the privacy restrictions set forth in the Family Educational Rights and Privacy Act (FERPA).